Finally we have the warmest April ever here in Germany; And it feels good to sit on the balcony in the evening when it’s still warm and the sun sets while steaks are getting ready on the grill. Eventually a desire for a nice bottle of wine comes up and one is magically driven to hurry in the cellar and pick one. 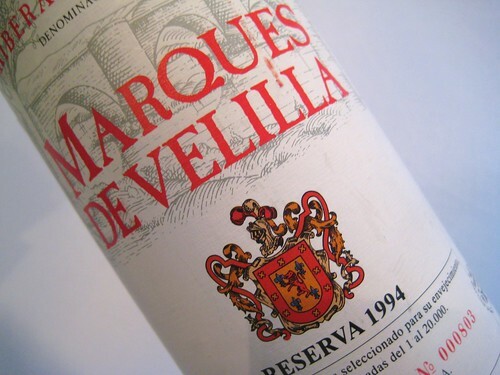 That evening, one of 2 bottles of the 1994 Marques De Velilla Reserva from the Ribera Del Duero which I got from an Ebay auction came into my hands. I bought them for little money, 20 Euro for both – or at least such was my feeling, since I wasn’t really aware of this Bodega and could only find a few hints on their quality in the www. The wine had an elegant dark red colour with slight purple shades, brilliant on the sides and slightly opal on the inside. Its nose was seductive with currant, vanilla and a hint of cinnamon. On the palate again a nice and elegant vanilla note; wood has been employed perfectly here, not overwhelming, just elegant and subtle. Fruit notes such as black currant were apparent and made the wine juicy, but again, elegant balance was found with some perfectly silky melted tannins. This wine was at best drinking age and I guess it reached a point where it will stay for some years without deteriorating; it might just change a little to become even more elegant. Finally it also had a beauriful, never-ending length. Unfortunately our glasses got empty much too fast; you couldn’t get enough of it. This was one of the best bargains I ever had, 10 Euro for some 92-93 points of pleasure. The downside is, I would buy more of it, if I only knew where to get it! ?